OREN AMBARCHI, STEFANO PILIA and MASSIMO PUPILLO (ZU) team up for an instrumental trip bridging post rock, drone and improvisation. Since the late nineties Oren Ambarchi has been exploring new grounds as composer and multi-instrumentalist (mainly focusing on guitar), fusing a wide range of influences and inspiration from improvisation, contemporary music, modern electronics and rock, and has been building an impressive catalogue of solo or collaborative albums with acclaimed artists such as KEIJI HAINO, JOHN ZORN, OTOMO YOSHIHIDE, JIM O’ROURKE, PHIL NIBLOCK, EVAN PARKER or SUNN O))). Bassist MASSSIMO PUPILLO has gained high reputation as founding member of Italian jazz-core trio ZU and in different projects / collaborations with a.o. FM EINHEIT, MATS GUSTAFSSON, LASSE MARHAUG and both BRÖTZMANNS (PETER and CASPAR). Last but not least there’s STEFANO PILIA on guitar, member of 3/4HADBEENELIMINATED and the BELFI / GRUBBS / PILIA trio, playing with MIKE WATT in IL SOGNO DEL MARINAIO and for ROKIA TRAORE and featured on collaborations with DAVID TIBET, JOHN PARISH or GIUSEPE IELASI. 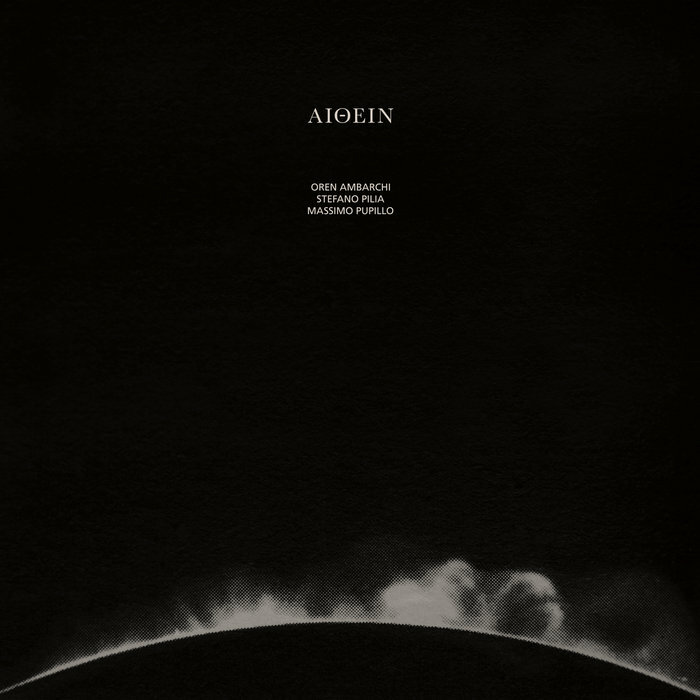 On “Aithein”, recorded live in Bologna in april 2015, the three embark on a captivating trip that starts quietly with reductive sounds only to raise volume and intensity on its way towards an cathartic peak (or skywards, considering the album title that references different meanings of ether).